Sequoia sempervirens /sɪˈkɔɪ.ə sɛmpərˈvaɪrənz/  is the sole living species of the genus Sequoia in the cypress family Cupressaceae (formerly treated in Taxodiaceae). Common names include coast redwood, coastal redwood  and California redwood. It is an evergreen, long-lived, monoecious tree living 1,200–1,800 years or more. This species includes the tallest living trees on Earth, reaching up to 379 feet (115.5 m) in height (without the roots) and up to 29.2 feet (8.9 m) in diameter at breast height (dbh). These trees are also among the oldest living things on Earth. Before commercial logging and clearing began by the 1850s, this massive tree occurred naturally in an estimated 2,100,000 acres (850,000 ha)[ citation needed] along much of coastal California (excluding southern California where rainfall is not sufficient) and the southwestern corner of coastal Oregon within the United States. The coast redwood can reach 115 m (377 ft) tall with a trunk diameter of 9 m (30 ft). It has a conical crown, with horizontal to slightly drooping branches. 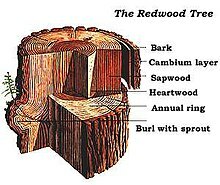 The bark can be very thick, up to 1-foot (30 cm), and quite soft and fibrous, with a bright red-brown color when freshly exposed (hence the name redwood), weathering darker. The root system is composed of shallow, wide-spreading lateral roots. The northern boundary of its range is marked by groves on the Chetco River on the western fringe of the Klamath Mountains, near the California-Oregon border. The largest (and tallest) populations are in Redwood National and State Parks ( Del Norte and Humboldt Counties) and Humboldt Redwoods State Park ( Humboldt County, California), with the majority located in the much larger Humboldt County. The southern boundary of its range is the Los Padres National Forest's Silver Peak Wilderness in the Santa Lucia Mountains of the Big Sur area of Monterey County, California. 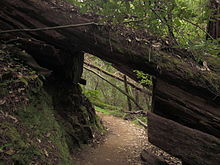 The southernmost grove is in the Southern Redwood Botanical Area, just north of the national forest's Salmon Creek trailhead. The southernmost grove can be seen from California Highway 1 at the approximate coordinates 35°49'42 N 121°23'14 W.
Coast redwood reproduces both sexually by seed and asexually by sprouting of buds, layering, or lignotubers. Seed production begins at 10–15 years of age. Cones develop in the winter and mature by fall. In the early stages, the cones look like flowers, and are commonly called "flowers" by professional foresters, although this is not strictly correct. Coast redwoods produce many cones, with redwoods in new forests producing thousands per year. 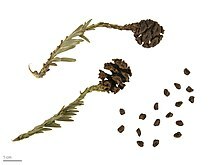 The cones themselves hold 90–150 seeds, but viability of seed is low, typically well below 15% with one estimate of average rates being 3 to 10 percent. The low viability may discourage seed predators, which do not want to waste time sorting chaff (empty seeds) from edible seeds. Successful germination often requires a fire or flood, reducing competition for seedlings. The winged seeds are small and light, weighing 3.3–5.0 mg (200–300 seeds/g; 5,600–8,500/ounce). The wings are not effective for wide dispersal, and seeds are dispersed by wind an average of only 60–120 m (200–390 ft) from the parent tree. Seedlings are susceptible to fungal infection and predation by banana slugs, bush rabbits, and nematodes. Most seedlings do not survive their first three years. However, those that become established grow very fast, with young trees known to reach 20 m (66 ft) tall in 20 years. Redwoods may also reproduce using burls. A burl is a woody lignotuber that commonly appears on a redwood tree below the soil line, though usually within 3 metres (10 ft) in depth from the soil surface. Coast redwoods develop burls as seedlings from the axils of their cotyledon, a trait that is extremely rare in conifers. When provoked by damage, dormant buds in the burls sprout new shoots and roots. Burls are also capable of sprouting into new trees when detached from the parent tree, though exactly how this happens is yet to be studied. Shoot clones commonly sprout from burls and are often turned into decorative hedges when found in suburbia. Coast redwood is one of the most valuable timber species in the lumbering industry. In California, 899,000 acres (3,640 km2) of redwood forest are logged, virtually all of it second growth. Though many entities have existed in the cutting and management of redwoods, perhaps none has had a more storied role than the Pacific Lumber Company (1863–2008) of Humboldt County, California, where it owned and managed over 200,000 acres (810 km2) of forests, primarily redwood. Coast redwood lumber is highly valued for its beauty, light weight, and resistance to decay. Its lack of resin makes it resistant to fire. Extensive logging of redwoods began in the early nineteenth century. The trees were felled by ax and saw onto beds of tree limbs and shrubs to cushion their fall. Stripped of their bark, the logs were transported to mills or waterways by oxen or horse. Loggers then burned the accumulated tree limbs, shrubs, and bark. The repeated fires favored secondary forests of primarily redwoods as redwood seedlings sprout readily in burned areas. The introduction of steam engines let crews drag logs through long skid trails to nearby railroads,  furthering the reach of loggers beyond the land nearby rivers previously used to transport trees. This method of harvesting, however, disturbed large amounts of soil, producing secondary-growth forests of species other than redwood such as Douglas-fir, grand fir, and western hemlock. After World War II, trucks and tractors gradually replaced steam engines, giving rise to two harvesting approaches: clearcutting and selection harvesting. Clearcutting involved felling all the trees in a particular area. It was encouraged by tax laws that exempted all standing timber from taxation if 70% of trees in the area were harvested. Selection logging, by contrast, called for the removal 25% to 50% of mature trees in the hopes that the remaining trees would allow for future growth and reseeding. This method, however, encouraged growth of other tree species, converting redwood forests into mixed forests of redwood, grand fir, Sitka spruce, and western hemlock. Moreover, the trees left standing were often felled by windthrow; that is, they were often blown over by the wind. Trees over 200 feet (60 m) are common, and many are over 300 ft (90 m). The current tallest tree is the Hyperion tree, measuring 379.3 ft (115.61 m). 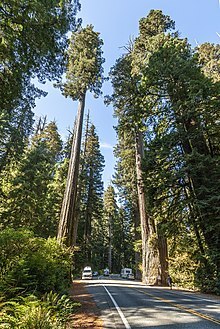 The tree was discovered in Redwood National Park during the summer of 2006 by Chris Atkins and Mchael Taylor, and is thought to be the world's tallest living organism. The previous record holder was the Stratosphere Giant in Humboldt Redwoods State Park at 370.2 ft (112.84 m) (as measured in 2004). Until it fell in March 1991, the "Dyerville Giant" was the record holder. It, too, stood in Humboldt Redwoods State Park and was 372 ft (113.4 m) high and estimated to be 1,600 years old. This fallen giant has been preserved in the park. As of 2016, no living specimen of other tree species exceeds 100 m (328.1 ft). Numerous historic reports exist of Redwood trees 350 to 400 feet high, a tree reportedly 375 feet (114.3 m) in length was felled in Sonoma County by the Murphy Brothers saw mill in the 1870s  another claimed to be 380 ft (115.8 m) was cut down in 1914,  and one tree was even reported to be 424 ft (129.2 m) was felled in November 1886 by the Elk River Mill and Lumber Co. in Humboldt County, yielding 79,736 marketable board feet from 21 cuts. However, these accounts and many others must be viewed with some skepticism as limited evidence corroborates the measurements, and exaggerated claims were not uncommon in the lumber industry. ^ Farjon, A. & Schmid, R. (2013). "Sequoia sempervirens". The IUCN Red List of Threatened Species. 2013: e.T34051A2841558. doi: 10.2305/IUCN.UK.2013-1.RLTS.T34051A2841558.en. Retrieved 16 January 2018. ^ Yang, Z.Y. ; Ran, J.H. ; Wang, X.Q. (2012). "Three Genome-based Phylogeny of Cupressaceae s.l: Further Evidence for the Evolution of Gymnosperms and Southern Hemisphere Biogeography". Molecular Phylogenetics and Evolution. 64 (3): 452–470. doi: 10.1016/j.ympev.2012.05.004. PMID 22609823. ^ Neale, DB; Marshall, KA; Sederoff, RR (1989). "Chloroplast and Mitochondrial DNA are Paternally Inherited in Sequoia sempervirens". Proceedings of the National Academy of Sciences. 86 (23): 9347–9. Bibcode: 1989PNAS...86.9347N. doi: 10.1073/pnas.86.23.9347. PMC 298492. PMID 16594091. ^ Ramage, B.S. ; OʼHara, K.L. ; Caldwell, B.T. (2010). "The role of fire in the competitive dynamics of coast redwood forests". Ecosphere. 1 (6). article 20. doi: 10.1890/ES10-00134.1. ^ a b c d Stone, Edward C.; Vasey, Richard B. (January 12, 1968). 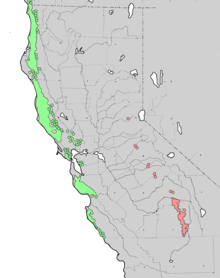 "Preservation of Coast Redwoods on Alluvial Flats". Science. 159 (3811): 157–161. Bibcode: 1968Sci...159..157S. doi: 10.1126/science.159.3811.157. JSTOR 1723263. PMID 17792349. ^ a b Koch, G.W. ; Sillett, S.C.; Jennings, G.M. ; Davis, S.D. (2004). "The limits to tree height". Nature. 428 (6985): 851–854. Bibcode: 2004Natur.428..851K. doi: 10.1038/nature02417. PMID 15103376. ^ a b Ishii, H. T.; Jennings, Gregory M.; Sillett, Stephen C.; Koch, George W. (July 2008). "Hydrostatic constraints on morphological exploitation of light in tall Sequoia sempervirens trees". Oecologia. 156 (4): 751–63. Bibcode: 2008Oecol.156..751I. doi: 10.1007/s00442-008-1032-z. PMID 18392856. ^ Mullen, L. P.; Sillett, S. C.; Koch, G. W.; Antonie, K. P.; Antoine, M. E. (May 29, 2009). "Physiological consequences of height-related morphological variation in Sequoia sempervirens foliage" (PDF). Tree Physiology. 29 (8): 999–1010. doi: 10.1093/treephys/tpp037. PMID 19483187. Archived from the original (PDF) on January 9, 2012. ^ Ishii, H. T.; Azuma, Wakana; Kuroda, Keiko; Sillett, Stephen C. (May 26, 2014). "Pushing the limits to tree height: Could foliar water storage compensate for hydraulic constraints in sequoia sempervirens?". Functional Ecology. 28 (5): 1087–1093. doi: 10.1111/1365-2435.12284. ^ a b Burgess, S. S. O.; Dawson, T. E. (2004). "The contribution of fog to the water relations of Sequoia sempervirens (D. Don): foliar uptake and prevention of dehydration". Plant, Cell and Environment. 27 (8): 1023–1034. doi: 10.1111/j.1365-3040.2004.01207.x. ^ Oldham, A. R.; Sillett, S. C.; Tomescu, A. M. F.; Koch, G. W. (July 2010). "The hydrostatic gradient, not light availability drives height-related variation in Sequoia sempervirens (Cupressaceae) leaf anatomy". American Journal of Botany. 97 (7): 1087–97. doi: 10.3732/ajb.0900214. PMID 21616861. ^ Dawson, T. E. (1 September 1998). "Fog in the California redwood forest: Ecosystem inputs and used by plants" (PDF). Oecologia. 117 (4): 476–485. Bibcode: 1998Oecol.117..476D. doi: 10.1007/s004420050683. PMID 28307672. ^ Simonin, K. A.; Santiago, Louis S.; Dawson, Todd E. (July 2009). "Fog interception by Sequoia sempervirens (D. Don) crowns decouples physiology from soil water deficit". Plant, Cell and Environment. 32 (7): 882–892. doi: 10.1111/j.1365-3040.2009.01967.x. PMID 19302173. ^ a b c Earles, J. M.; Sperling, O.; Silva, L. C. R.; McElrone, A. J.; Brodersen, C. R.; North, M. P.; Zwieniecki, M. A. (2015). "Bark water uptake promotes localized hydraulic recovery in coastal redwood crown". Plant, Cell & Environment. 39 (2): 320–328. doi: 10.1111/pce.12612. PMID 26178179. ^ Tognetti, R. A.; Longobucco, Anna; Rashi, Antonio; Jones, Mike B. (2001). "Stem hydraulic properties and xylem vulnerability to embolism in three co-occurring Mediterranean shrubs at a natural CO2 spring". Australian Journal of Plant Physiology. 28 (4): 257. doi: 10.1071/PP00125.